“Insurable Employment does not include…related people” Part 1, Paragraph 5, Subsection (2)(i) of the EI Act. Employment Insurance is a social program that contributes to the security of all Canadians by providing assistance to workers who lose their jobs. A portion of the employee's paycheck is submitted to the government. The employer also contributes 1.4 times the amount that is deducted from the employee. This is done to ensure that the government E.I. pool will constantly have adequate funds to assist Canadians who suffer job losses. Makes sense, right ? But would it make sense for the employer and the employee to contribute if they weren't eligible to ever make a claim? Many people who work for or employ a relative and pay EI, are unaware that submitting EI premiums doesn’t guarantee that they can collect them. Direct family members are typically not eligible to qualify for EI benefits. If it is determined that your employment is uninsurable, then you should not have been paying premiums, and are entitled to a refund. 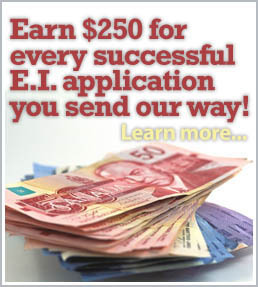 PLUS, you are entitled to an exemption and will never have to pay EI again! Unfortunately, most people find this out after the fact, and are only told that they are not eligible to receive EI coverage on the day they need it the most – when they apply for it. Yet, until you go through the proper motions, you cannot stop paying those premiums. The consequences of stopping deductions without following the correct procedures include additional assessments, interest, penalties and the loss of your refund. 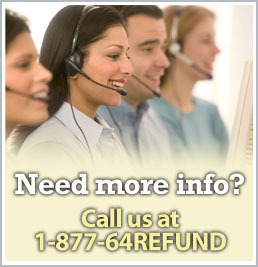 At Canadian Refunds Inc. we specialize in Employment Insurance refunds. We manage the bureaucratic process by taking care of the paperwork and coaching our clients throughout. Applying for these refunds must be done in strict accordance with Government regulations. We are familiar with the tedious process, and we know and completely understand the intricacies involved in the system. Canadian Refunds Inc. deals directly with the government on our clients' behalf. If the applications are filled out in an improper manner, the claims can be denied and it is difficult to overturn a negative ruling. We handle all the paperwork, details, and communication to ensure that everything is done correctly the first time. As your Representative, we track the claims throughout the Government refund process to ensure that our clients' receive the refunds that they are entitled to. Having a professional deal with the government will save you time and money. It will allow you to carry on with what you do best – running your business. We work with you to ensure that you get what you deserve. If you are entitled to a refund, we make sure you get it quickly and with very little stress or time commitment on your part. With Canadian Refunds Inc., our clients will benefit from a fast unobtrusive process and proven results. If you do not save money – you do not pay. Its that simple. Additionally, our contingency fee only applies to refunds for current and past years. We do not bill or participate in your significant savings of future years. We take pride in our proven track record of recovering money on behalf of hard working family businesses and their family members. We look forward to the opportunity to do the same for you.